THE MOST COMPREHENSIVE GUIDE TO DEVELOPING A THRIVING & HEALTHY LIFESTYLE! Evolving Health presents a comprehensive guide to what you need to know about improving your health. In our research studies, we have found that it does not matter how old you are or how long you may have followed a less-than-perfect diet. Simple steps will get you on the path to the best of health. This book provides a clear and precise map to those steps. Evolving Health is for those who are ready to evolve to a higher level – a more vibrant lifestyle. Evolving Health is for those ready to commit to making a profound and lasting difference in their lives, not just a little bit better. Evolving Health is for those who are ready to turn their lives around in a whole new direction! 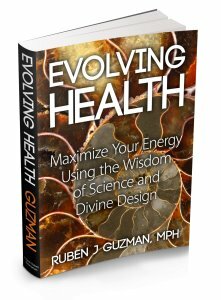 Evolving Health is a must read for all those interested in better health. Ruben calls on his extensive background as a health professional, educator, coach and seminar leader to bring us information that can be put to use immediately. I particularly like how Ruben explains the science behind his recommendations in a way that is informative and engaging to both the scientific and non-scientific reader. Excellent book – which I highly recommend! I had started working with Coach Ruben in 2004 and I knew his teachings were sound and meant to be life-long, even though I resisted them for quite some time. But as the saying goes, “when the student is ready, the teacher appears.” Now that I am in a graduate program for Nursing Leadership, I realized that if I am truly committed to transforming healthcare, then I would need to lead by example! The Evolving Health program provided me with reminders about exercise and nutrition. But, the most valuable key lesson was the segment about self-sabotage and the mental game that can stop progress. As a result of being in the 2010 summer program, I lost 40 pounds in 5 months and dropped two sizes. I have energy that lasts from5 amto well into the evening. My blood sugar levels are now stable and it’s leveled out my emotions, which means I don’t eat mindlessly because of emotions. I have gained a sense of well being that I’ve never had from the physical activity and it provides a positive effect on my mental and spiritual outlook. I decided to participate so I could learn information for myself and my clients. What I discovered was the most efficient exercise program, and a food ladder that I agree with and could share with my clients. I then became fully plant-based in my diet for six weeks, and am staying mostly plant-based with occasional fish, and have been regularly exercising 5 – 6 days per week! As a result, I feel clearer spiritually and have increased my energy!! I wanted to know more about being healthy and I wanted to find strategies that would help me do more of what I needed. I learned why I had a hard time exercising consistently – my old blueprint was that adult women (my mother) did not exercise – what was important was to be “thin and beautiful.” I also gained a greater understanding about how my body works. Subsequently, I decided to take responsibility for my exercise. I even worked out 6 days last week! As a result, I am getting stronger physically, I feel good emotionally, I am mentally alert and spiritually connected! I was aware of my poor health and physical state before the program, but I was unaware of the poor nutrition I had. Subsequently, I became fully plant-based in my diet and increased my physical fitness. As a result, I lost 15 pounds in just a few weeks, and feel like I am honest with myself for the first time around food. I have broken my addiction to sugar and it feels great! !